Note that development for this plugin has ceased. The download link is no longer valid. If you follow the link, it will bring you alternatives. The following article will remain for archive purposes. The easiest way to create a Sitemap for a Joomla 3 website is to use one of the many Extensions available. In this guide we will walk you through creating a sitemap.xml file for a Joomla 3 website, using the Xmap extension. Creating a sitemap can help Google crawl your website more accurately, since it provides a list of all your pages. Click here to learn more about Joomla Hosting. Download the Xmap Package here. Login to the Admin Dashboard for Joomla 3. Click the Choose File button and select the file you downloaded in step 1. Click the Upload & Install button. You will then see a message stating "Installing package was successful." Click Extensions in the main menu, then click Plugin Manager. In the search box, type Xmap, then hit the Enter key to search. You will see a list of all the included Xmap plugins. Click the red X next to Xmap - WebLinks Plugin, and Xmap - Content Plugin to enable them. You will see a green check beside them once they are enabled successfully. In the main menu, click Components, then Xmap. On the next screen, enter a name for sitemap in the Title field, and change the Status to Published. Make sure the Access setting is set to Public. Select the Menus tab. Click the check box next to the menus you want included in the sitemap. The other fields are not required, click the Save button when you are finished. You will then see a message stating "Item successfully saved." 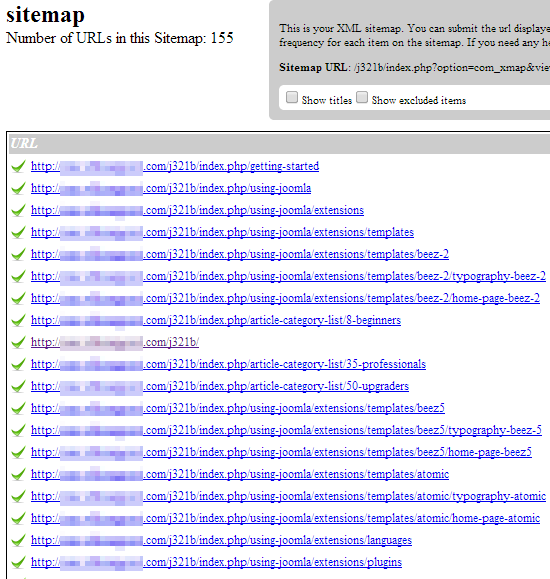 Congratulations, now you know how to a generate a sitemap.xml file for a Joomla 3 website, using the Xmap extension. Wow! that was an amazing list, just buzzing after reading that. Very informative, rich in details and easy read. I will try out your awesome techniques and let you know how it goes. Thanks! Nick, I'm glad we were able to help! The download link is wrong: http://www.jooxmap.com/downloads.html, it don't work. Unfortunately, they have discontinued support for it. I have added a note to the top of the page warning people about the issue. The link for the software does lead to other possible solutions. The article will remain for archive purposes.